I love those! 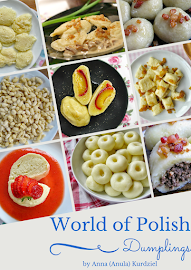 In Poland we call them 'knedle'. 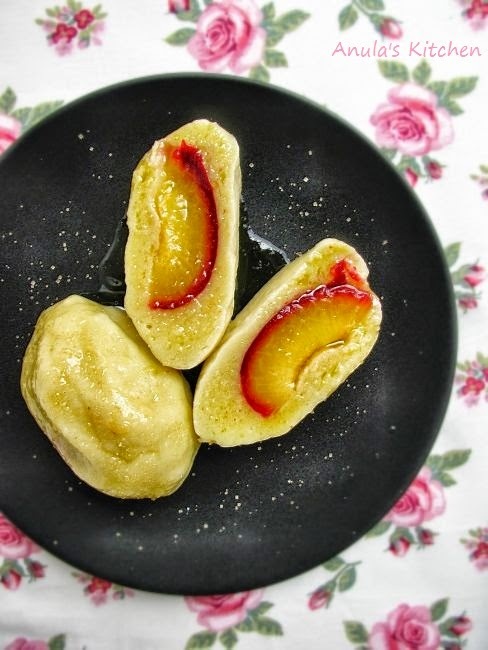 The recipe is very easy but there is a lot of preparation - especially shaping those little dumplings and hiding a plum inside. I remember when I was a little girl I really wasn't very fond of them, they kind of "grew" inside my mouth.. Now I just love them! I think it's maybe because they also remind me of me childhood and my family home... 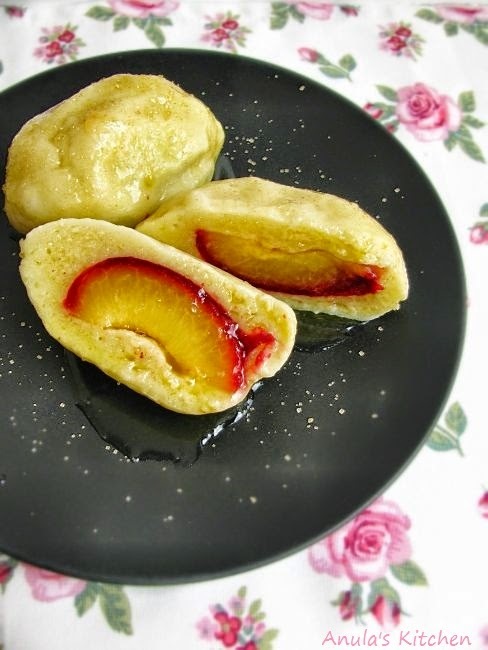 Traditionally they're made with plums, but you can also put apricots, whole strawberry and other fruits inside. You can eat knedle simply with some melted butter poured over and sprinkled with some sugar, as we do at my home. Knedle can also be served with breadcrumbs fried in butter or sugar and a dollop of cream on the top. I think they're perfect either way and make a fantastic sweet lunch or dinner! Mix mashed potatoes with eggs and both flours. It has to be a nice dough, not too sticky but not too dry either - or your dumplings won't hold together. Cover your hands in flour a little, to prevent sticking and tear some small ball of dough and form a pancake. Put half of a plum dipped in the sugar in the centre of your pancake. Form a ball - you have to stick it very well together, or your dumplings will disintegrate in the boiling water. When you have all your dumplings done put them into salted, boiling water and boil for 10 min from the moment when they reach the surface. Eat hot, sprinkled with sugar and some unsalted melted butter or cream :) If you're left with some (and I hardly doubt that you will...) you can reheat uneaten boiled knedle on a pan with some butter. If your plums are particularly large, as mine were, you can use only half the plum or even cut i in quarters, or your knedle will be nearly the size of a tennis ball ;) Also if the plums are very juicy I wouldn't add any sugar inside, but be more generous then when sprinkling knedle with sugar just before serving.